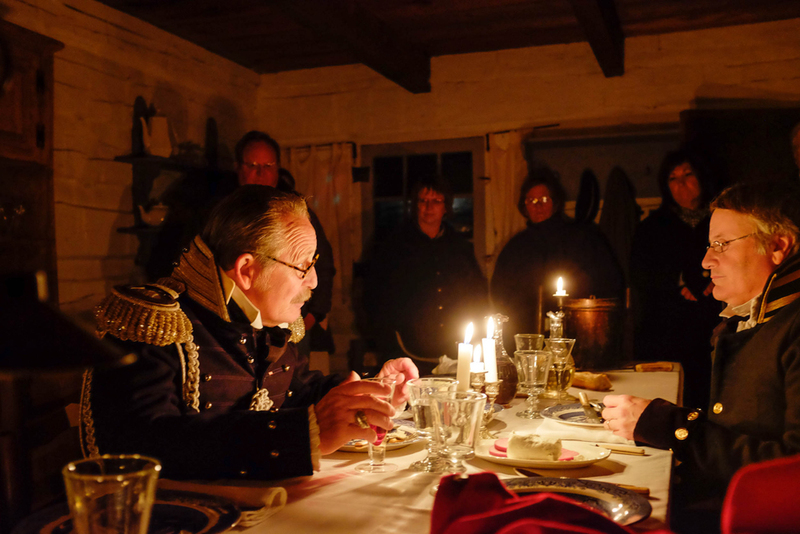 Col Tom woods as Colonel Leavenworth and Bob Baker as Captain of the rifle regiment dine in the officer’s dining room. A bright moon shown as visitors strolled through history at Fort Atkinson State Historical Park by candle light Saturday evening. The first stop along the way was a vigil for the deceased Lieutenant Taylor. As the visitors moved along the guided tour they learned about the workings of the military post. They also watched and listened as officers, soldiers and civilians went about their various chores and responsibilities and gossiped about the deceased lieutenant. The Candle Light Tour is the highlight and the end of the 2014 season. The Living History days are held the first weekend of the month from May through October. 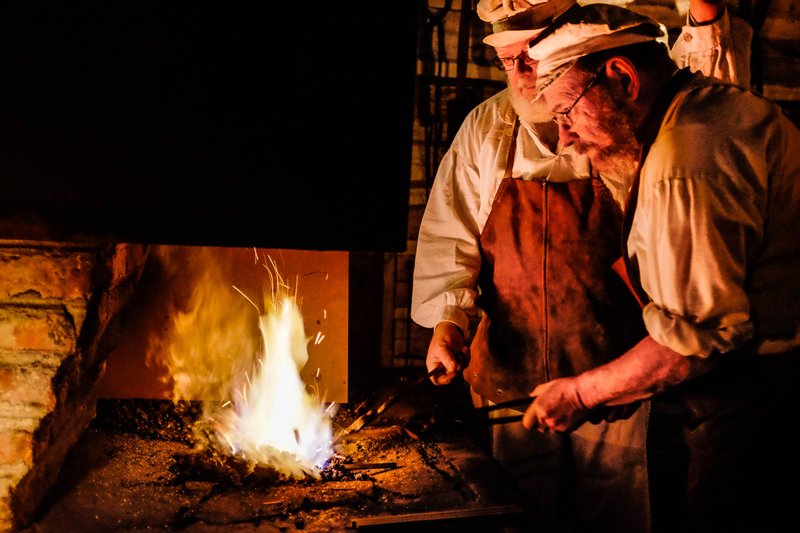 Doug Appel and Dean Slader fire metal rods at the forge in the Blacksmith’s shop to makel tent stakes. Col. Tom Woods as Colonel Henry Leavenworth works completes daily report. Officer’s cook Julie Ashton plays a tin whittle as lights from the barracks blaze in the background. Ashton is also Washington County Historical Museum director. Visitors to the fort in the background watch as the soldiers roll cartridge tubes in the enlisted men’s mess. Donna Jones and Jacqueline Ericson spin and weave.